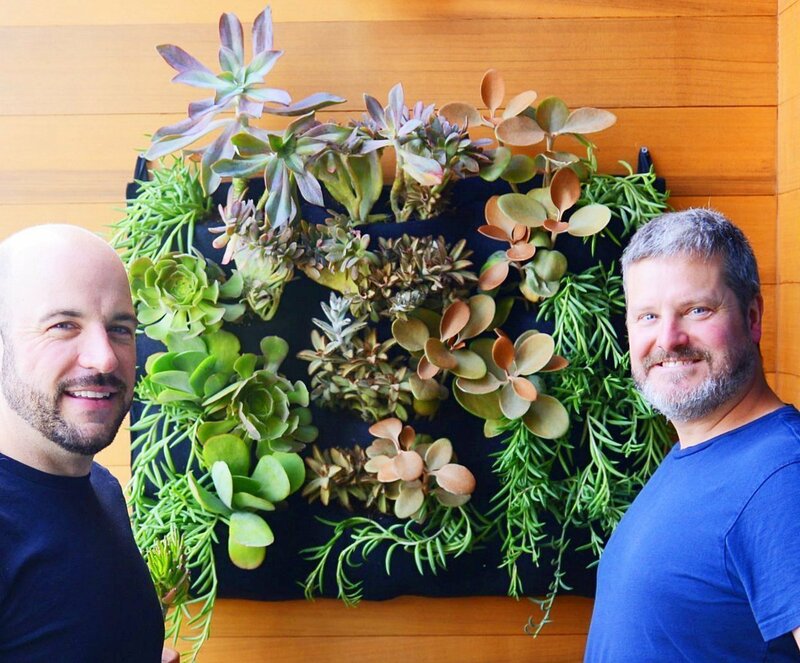 Chris and Gary used a 12-Pocket Florafelt Vertical Garden Planter to create an easy care succulent display for their San Francisco balcony. Succulents are great for saving water and can be hand watered weekly. The planting design incorporated earthy tones to blend with the natural wood siding. Then incorporated a base of green on the edges to give definition. Use of trailers let it hang down wile other succulents will reach upward. The Florafelt 12-Pocket Planter is 32 inches wide and 24 inches tall. The felt pockets are pre-stapled to a lightweight plastic board that has nylon tabs on the top corners. Simply hung from deck screws. Succulents are a great way to learn vertical gardening if you have the right conditions. First you’ll need lots of bright light and no frost conditions. Best for our more arid states and continents. Chris and Gary use a hand pumped pressure sprayer to water once a week and also rinse off the plants. Succulents like to go nearly dry between waterings. They are so easy you even place a cutting in soil and they will root and grow. For their design each pocket receives a felt wrapped wrap grouping of plants. In this case two 4 inch potted plants are placed into each pocket. By arranging pairs or groupings a more detailed flow can be created. Chris Bribach demonstrates how use Florafelt Root Wraps to create a succulent display.